I had my 2009 s4 avant MRC'd on Friday, as far as I can tell there were no issues with the mapping and the car made 473ps so relatively healthy.. The issue comes with the way the gearbox now behaves. At a high rpm gear change pre-mapping the exhaust would make a noticeable 'farting' sort of sound, this has now completely disappeared. When accelerating WOT from a standstill the car is now slower off the line up till about 3k rpm in first gear when it then exceeds previous performance. I have tried this with ASR completely off in S mode. Another interesting thing to note is that when in D with ASR on the car short shifted in 1st @ 4k RPM which it has never previously done (a feature of the new mapping I assume?). I haven't tried launch control as I assumed the car didn't have it as it is early 2009? Will it now be enabled with the s tronic map or is my car too old? I will try this when I get an opportunity. At very low rpm's in D mode the car now seams to almost struggle more like its holding onto a higher gear for longer, for example it may stay in 2nd gear until almost stationary and if I then accelerate lightly it is slightly hesitant. I didn't notice this before mapping, has anyone else experienced this? (it is subtle). Just looking for some insight from someone with a mapped car who may be able to answer some of these questions. I had my 2009 s4 avant MRC'd on Friday, as far as I can tell there were no issues with the mapping and the car made 473ps so relatively healthy.. . This is kind of related to your below question about LC. From what I gather 2009s didn't have LC however, what I am not sure if Doug was able to activate it as part of TCU map or not. Maybe @Dippy can shed some light. It is also highly likely that in the absence of LC you are getting wheel spin, which is why the car is either slow off the line or short-shifting. Normal behaviour or shall we say you'll have to adjust to your driving style or learn to adjust to gearbox behaviour . The hesitation is likely due to the fact that the gearbox is expecting you to slow-down and therefore has the lower gear pre-selected and you accelerate or vice-versa. Yes that was me with the blue avant! That answers some of my questions, thanks. I'm still not sure about the gear change noise though, it used to only occur at high rpm gear changes when Wot. But now there is no exhaust noise on gear changes at any rpm infact the exhaust note in general sounds different. This is the main thing that interests me because I was a fan of the noise it used to make. I need to do some more testing to work out what's happening when I accelerate off the line I think.. I don't think it was spinning the wheels, it was dry conditions with good tyres and it didn't feel like it was slipping? Ah right, I'm probably underestimating it. I'll definitely do some more testing in that case.. It's just a shame about the exhaust noise, I can't get my head round that. IIRC, the Supercharger whine after the remap takes over any stock exhaust noise however I can't be 100% as it has been almost 12-ish months that I have been running Milltek on mine. I had my stock exhaust on only for a few months before changing it with however, there are a few forum members who are still running stock exhausts on their MRC stage 2 cars and I believe they'll be able to answer it / shed some light on this issue. Re: the wheel spin, what tyre pressures are running on? I have got the wheelspin almost everytime I have tried getting off the line without LC wether traction was off or not. Like you said, maybe try it a few more times and see how it performs. At the time my tyre pressures were around 36.5psi front and 36psi rear when I measured them cold a few days before. 255 35 19 PS4s that have covered about 800 miles. It sounds like you're un-happy with the mapping they've done. That being the case, you should speak to them and ask any questions you might have. The laggier pull away sounds as if they've may reduced torque at low speed/ low RPM, to improve traction. You can use my right foot for traction control, so that seems a little counter intuitive considering why you've had the thing remapped in the first place. Regarding the upshift fart, it sounds like they've mapped it out which would grate on me too, as I quite like it. The best way to tell for sure is to het the car nice and hot, load it up in second at WOT, gearbox in 'S' and ADS in Dynamic and let the gearbox change up. If you don't hear it then, it's not there anymore. Yeah that's true enough, I mentioned the upshift noise on here because I thought if it was mapped out more people would have mentioned it. I couldn't conceive that it would be mapped out though, I did a fair few spirited upshifts and didn't hear it. I wish I'd realised sooner so I could have spoke to them while I was in the area as I'm a long way from Oxford..
@S3_Mitch - my first advice is to reserve judgement for a week or so. It can take some time/mileage for various settings to stablise after a fresh tune - at least that's what I found. Then if you still have problems then go back to MRC. Since you have stage 2 it should definitely not be slower until 3K and not short shift. You may have other issues such as misalignment. Also unless MRC has changed it recently, they do not change shift points in the TCU. I can't confirm if MRC can enable LC in a 2009 'box - you'll need to check with MRC. I have no interest in stressing my clutchpacks with LC. I have found that the "fart" (which I also have no interest in) is less obvious following my remap. This does make sense because the MRC TCU remap does quicken the gearchanges somewhat and so the effect will be reduced. Finally I'm dubious about those tyre pressures. I run my fronts at 39psi. Thanks for the input Dippy. I fully intend on doing some more testing etc to fully get to grips with the new tune. The nature of my questions was more to try and establish if there were some known changes produced by the tcu tune that may cause some of the symptoms I have described. Since MRC didn't tell me what to expect I wasn't sure if I was missing something obvious. Regarding the short shift, it only occurred once when the asr was on and the car was in D mode. This leads me to believe it was related to the traction control but its never happened before so I was just wondering if it was a feature they mapped in or factory. I'm not fussed about LC either really but I'm interested to try it once if the option was there. I was conscious of the fact that the increased shift speed could be a factor influencing the disappearance of the shift noise but I was surprised. I set my tyre pressures a fair few weeks back in the hot weather, at the time I set 38ish front and 37.5 rear but when I check recently the pressures have dropped due to the weather. I plan to change them next time I use the car, what do you recommend for pressures? I have found conflicting advice on the matter tbh but the higher pressures have generally felt better to me. I appreciate any advice especially from guys that have been running tuned cars for a while. The standard TCU tune changes gear in fractions of a second (40ms IIRC?!) and any reduction a remap can apply to this will be fractions of a fraction of a second. As such, the time the gearbox takes to shift gears, post remap, will have no effect on the 'fart'. A factor that will come into play on facelift cars, that may will make the 'fart' less noticeable, is that more's going on at a typical 'fart' inducing shift point, with the ECU and TCU being remapped. Your engine (and certain gearbox components) is likely spinning 6-700 rpm faster, that would generate more engine, supercharger and exhaust noise that would go some way to drown out the 'fart'. The OP wouldn't have this on his pre-facelift car of course. Even on my 'stockish' facelift, with inlet and supercharger tweaks that generate above stock levels of supercharger whine, I have to have my window down to really hear the 'fart'. Thanks Paul, that seems a credible explanation. Fortunately I don't care (my preference is to have a quiet "Q-car" so less noise the better), but it is interesting nonetheless. @S3_Mitch - traction is not an area that I'm particularly knowledgeable about. My tyres are 39/33 because that is what Audi recommends and I tend to follow that for safety reasons. My experience on this S5 as well as my previous B5 S4 is that when my tyre pressures are a bit low the feel and handling is adversely affected, so I monitor mine regularly. I know that the S4 and S5 have different recommended pressures. I'd expect your Avant to be higher than mine at the rear for the extra weight at the back. But although there are differences between the S4 and S5 in terms of wheel positioning, the front of the two models is very similar so I'd expect the tyre pressures to be similar. So to me your 36.5 front seems a bit low. Recently I did experience TC intervention. It was a sprint from the lights, not at WOT but lively, and I was surprised that the engine power was so retarded. After discussing it on the forum, I reached the conclusion that my Pirelli tyres are now wearing enough to affect traction. Although yours are not only new but are Michelins (better choice IMO), I'd still question if you have traction problems - tyre pressures or alignment. jdp1962, S3_Mitch and youngsyp like this. Can someone tell me what "WOT" is an abbreviation of? This one's escaping me. GarethS4, sus, Roadrunner146 and 1 other person like this. Roadrunner146, Tashfeen and jdp1962 like this. q5man, Roadrunner146 and scotty76 like this. Recommended pressures for the S4 are 36/33. Good point, mine’s on 19s. I can't be bothered to take a photo, but my S5 sportback sticker shows 39/33 for 255/35 R19, but also for the 245/40 R18 (which I think was an option). The R20 wheels got a 39/36 recommendation. The variation does seem weird. I do agree with Paul - it is important to find your own personal preference for how you like the steering and handling. Although I guess too much variation from the recommended pressures might affect tyre wear? I do agree with Paul - it is important to find your own personal preference for how you like the steering and handling. Although I guess too much variation from the recommended pressures might affect tyre wear? Agreed, along with other possibly unwanted side effects. 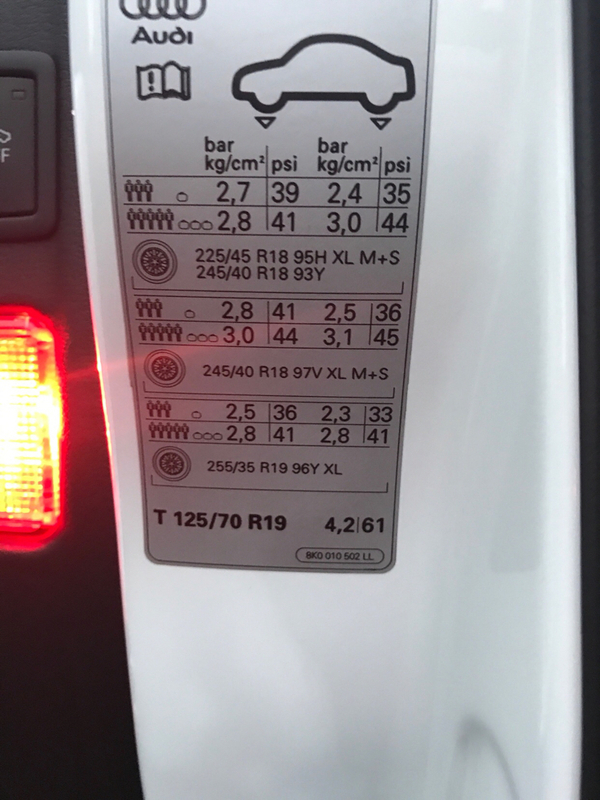 On my old Pulsar, I could feel the difference from changing the pressures by 1 psi, but didn't care how firm the already firm ride got , if an appreciable improvement in the aspect of handling I was after, transpired. Several, ever increasing in mass, cars later by contrast with the Avant, it takes a few psi to notice the difference. And that difference results in an unacceptable increase in ride firmness, even with the ADS set to Comfort for the dampers (my default mode). The difference wasn't really accompanied by an improvement in any aspect of the handling either. This is probably due to mass, or maybe the Dunlop SportMaxx tyres the car has fitted. If I was asked, I'd always recommend starting with the recommended tyre pressure and going from there, until you find the compromise that suits you. And the tyres you fit will likely dictate the biggest difference. Case in point - The wife's Exige has Pirelli P-Zero Corsa's as standard fit with a recommended pressure of 2.6bar (rear). We've just fitted some Michelin Pilot Sport Cup 2's and the recommended pressure for them is 2.2bar, mainly because of the stiffer tyre wall used. Clearly, the differences in tyres that are typically fitted to the S4 won't result in differences that large though. Tashfeen and S3_Mitch like this. Just a quick update, got carrista and checked the launch control counter (zero launches as expected).. Thought I'd test to see if it now has launch control.. It does. I was quite surprised the needle seemed to settle just over 4k rpm. Also surprised when I let off the brake.. Felt very quick off the mark never felt anything like it haha. I don't think I'll be putting the car through too many more though. Sure enough when I checked the launch counter it now reads 1, so I guess you can enable LC on a 2009 S4. sus, q5man, Tashfeen and 1 other person like this. sorry for the hijack but what size hole is drilled in the air box by mrc for the air box mod? Be careful putting hole in the air box though or you’ll end up with the same problem as running an open filter with water and muck gettin on the filter that comes through the poureous wheel arch liner.